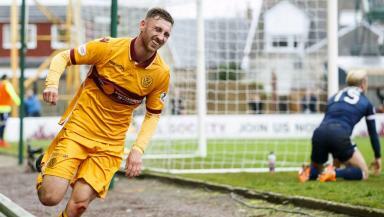 The win for the Steelmen takes them into ninth place in the Scottish Premiership. Motherwell won their first Scottish Premiership game in four with a surprisingly easy 4-1 thumping of Ross County at Fir Park. Veteran striker Scott McDonald headed in a Lionel Ainsworth free-kick after eight minutes before fellow striker's Louis Moult's cut-back was turned into his own goal by Staggies defender Kenny van der Weg. Right-back Richard Tait added a third in the 51st minute and Ainsworth walked in the fourth with Staggies substitute Alex Schalk, on for Liam Boyce, reducing the deficit in the 78th minute with an excellent strike. While Motherwell will be boosted by a convincing win which takes them into ninth place, the Highlanders dropped to 11th and are without a victory in nine games. Boss Jim McIntyre would have been dismayed at the loss of the opener to one of the smallest players on the park. After Well midfielder Chris Cadden was tripped racing down the right by Van der Weg, Ainsworth floated the free-kick into the packed penalty area and it was the diminutive Australian striker who steered the ball past keeper Scott Fox from 12 yards for his fifth of the season. The second goal arrived on the half-hour mark, albeit with a touch of fortune, when Moult's attempted cut back from the byeline came off the Van der Weg's leg and landed behind Fox. But the Highlanders responded when Van der Weg headed an Ian McShane corner over the bar in the 35th minute and McShane's low drive missed keeper Craig Samson's right-hand post by just inches, before Michael Gardyne's goal-bound shot was blocked by Well defender Ben Heneghan. However, if that brief period of pressure boosted County, they were deflated six minutes after the break when the home side increased their lead further. Fox was to blame when he was beaten at his near-post by Tait's powerful 16-yard drive after galloping forward unopposed, his first goal for the Lanarkshire side since signing in the summer from Grimsby. There was no way back for the visitors who enjoyed a let-off when Ainsworth's curling free-kick from 25 yards clipped the top of the bar on the way over. However, the Motherwell wide-man got his goal in the 62nd minute when he took a pass from McDonald and skipped around Fox before slipping the ball in at the post. The game drifted towards the final whistle thereafter, interrupted by Schalk's excellent first-time finish from Marcus Fraser's cross. However, Well remained relaxed, evidenced when 18-year-old Allan Campbell came on to make his debut as replacement for midfielder Lee Lucas with seven minutes remaining.